aLive wins 4-0 & advances to the Ro8! Prince wins 4-1 & advances to the Ro8! Rogue wins 4-2 & advances to the Ro8! Dark wins 4-0 & advances to the Ro8! 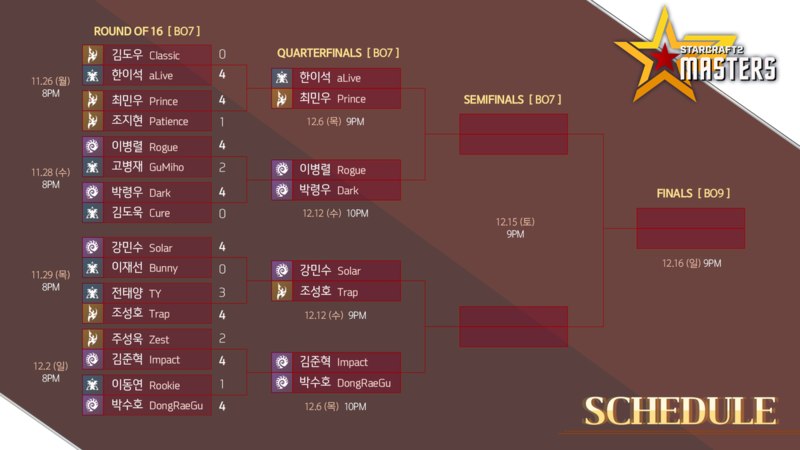 Solar wins 4-0 & advances to the Ro8! Trap wins 4-3 & advances to the Ro8! Impact wins 4-2 & advances to the Ro8! DongRaeGu wins 4-1 & advances to the Ro8! aLive wins 4-0 & advances to the Ro4! Rogue wins 4-1 & advances to the Ro4! Trap wins 4-3 & advances to the Ro4! DongRaeGu wins 4-3 & advances to the Ro4! Rogue wins 4-2 & advances to the finals! Trap wins 4-1 & advances to the finals! Rogue wins 5-3 & is the ONPOONG Masters Season 4 Champion! Rogue is playing insanely well this game 3. I liked Gumiho's game 1. I am glad to see Prince advancing but i fear aLive may be too much for him. Not live yet? Anything happened?